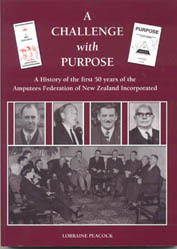 The book records the formation of what was originally the New Zealand Civilian Amputees Association (Inc.) and details its growth through the decades. The protracted pleas, submissions and deputations to Government for free prostheses are recorded, together with efforts to obtain associated support such as expenses incurred by out-of-town amputees in attending Artificial Limb Centres, and free crutches and wheelchairs. One chapter is entitled ‘Artificial Limbs and Their Management’ and includes some historical information about the artificial limb industry in New Zealand. The book is available free-of-charge and can be obtained from the National Coordinator.